I know that the macaron craze has died down a bit, but I still think they’re so cute. I actually like looking at them more than eating them! I just started needle felting and I wanted to share how I made these macarons. 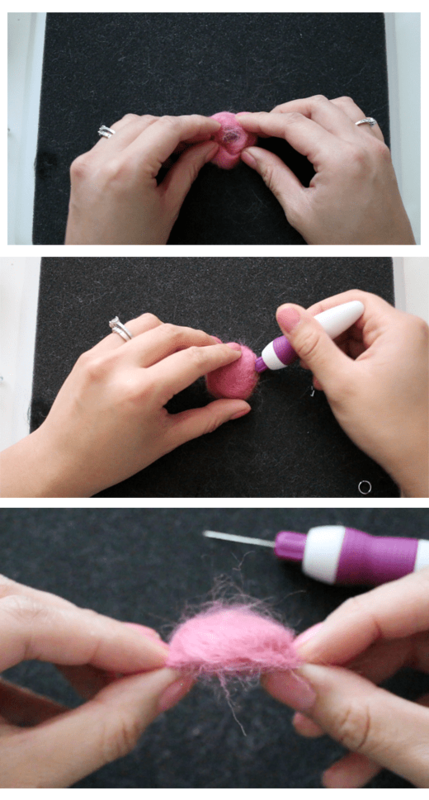 This is perfect for beginners and the materials used for needle felting isn’t too expensive. Because I’m new to YouTube and hoping for some subscribers, I am having a giveaway! Needle felting is basically using a special needle to tangle and mat wool fibers until they form the desired shape. I have also created a YouTube video, which is much easier to follow along as it shows the steps better than pictures can. However, for those who can’t watch the video, here is a general summary of the steps. Foam mat/sponge – you’ll need a foam mat to work on, as you’ll be poking a needle in and out of your project and you need to project your work surface. If you don’t have any foam, you can also use a sponge. I suggest putting a magazine or something similar under the foam/sponge to further project your work surface. Felting needle – these needles have tiny barbs towards the tip of the needle, to help tangle/mat the fibers. Using a regular needle will not work. You can either use it with a needle holder, like the one to the left, or just hold the needle by itself, like the one on the right. Ring or keychain – this is optional if you don’t want to make a keychain. You’ll need a small ring to attach the chain. I used a small jump ring found in the jewelry making section of the craft store. White wool roving – this will be the filling of the macaron, so feel free to use whatever color you like. You don’t need as much as pictured here. You’ll need about the same amount as a colored bundle. Colored wool roving – this will be the cookie part of the macaron, so you’ll want to tear off two similar-sized bundles to make your cookies even. You can use whatever color you like here as well. and 7. are optional but highly recommended. Finger guards (#6), will protect your fingers from accidentally getting pricked while you’re working. If you don’t have finger guards, you can use a folded piece of cardboard (#7) to hold the macaron when you’re joining all the pieces. 1. Take one colored wool bundle and fold it into a ball shape or roll it between your palms until it loosely resembles a ball. Start poking your needle in and out of the ball, and you’ll see the fibers start it hold its shape and shrink. Rotate often so you get an even shape. Make sure you only move your needle straight in and out. If you bend the needle, it can easily break! 2. Once you have more of a compact ball, start to poke only around the edges of the ball, to flatten it, but keep the center puffy. This will create a dome shape. Keep doing this until you get a dome that is solid but still a bit squishy. 3. Do the same for the other piece of colored wool, so you end up with two domes. With a slightly smaller ball of the white wool, do the same, but instead of a dome, you’ll want a flat circle. 4. Take your white felt circle and place it between your two domes. It should look like an over flowing macaron at this point. Poke the center of the macaron, making sure to go through one pink layer and into the white. This way, your cookies will start to attach to the filling. Don’t poke too much through the center, because you want to keep your cookie dome shaped. Then start poking at the edges, from the pink into the white layer, to further attach the two pieces. Using either the finger guards or the cardboard, hold the macaron up so you can start poking at the white wool to shape it. Poke the white wool so that it is at least the same size as the cookies or a bit smaller. 5. This is optional if you don’t want to make a keychain. Tear off a piece of white wool and twist it between your fingers to make a thin short line. Loop this through the ring, wrap it around the macaron center, and poke until the ring feels secure. Be extra careful when you’re near the ring. 6. To finish up, if you have a lot of stray fibers sticking out, you can get a pair of scissors to cut those off and now you’re done! So crafty hand! These look adorable. What a delightful tutorial! I too love looking at them way more than eating them and yours are the perfect size! Thank you for sharing this DIY felting. 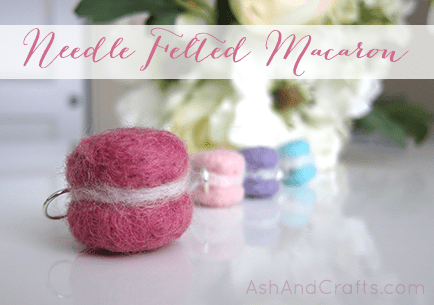 I had no idea that it took such a wad of felt to make those tiny little macaroons! Wow! Thanks so much Christine! The wool really does compact a lot and you end up with something much smaller! I was surprised to learn that too when I started!